This painting was a demonstration piece for a recent workshop I did for the Brevard Watercolor Society. I called it: Painting The Shadows First. First I want to talk briefly about layering colors. If I want an area of my painting to be dark brown, and I just paint browns in that area, the pigment will not get darker, it will simply get thick. In order to make a color darker in value, I need to layer that color against it's relative opposite. This is a sample of my value chart. I used a mixture of Burnt Sienna and French Ultramarine Blue (relative opposites on my color wheel) to create the dark, neutral color. I then painted the darkest mixture I could make, and still keep the color transparent, onto the number six square. I continued to paint the squares, progressively adding more water to the pigment/water mixture. I left the number one square white. This is a tool that I use often to judge values, the darkness or lightness of a color. This is a sample of a color wheel. You can learn more about the color wheel from lots of books, and I talk briefly about it on my Beginner's Workshop DVD. You can make a simple color wheel, and paint some of the colors from your palette onto the color wheel. 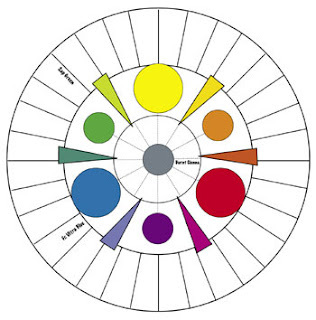 Or print a color wheel from many of the online art resources and use a marker to list which colors on your palette correspond to the areas of the color wheel. From there you can then see how to mix dark, neutral colors from the relative opposites on the color wheel. These mixtures can be physically mixed on your palette or glazed, layered wet onto very dry, to create rich, dark value contrasts in your paintings. I use this theory to build the dark values in my paintings. For instance, I use a lot of French Ultramarine Blue because it is a relatively pure, true blue in relation to my color wheel. If I look at my color wheel I can see that it is opposite many of my warm orange-brown colors, like Burnt Sienna and VanDyke Brown. I like to paint with glazes, and often I paint with only one color at a time. I allow it to dry, then glaze on another color to create the rich values, while maintaining the transparency of my pigments. Come back tomorrow to see the beginning of how this painting was built.